University Visit was organized by the Department of Career Guidance Counseling on 13th August 2018 in the AV room. 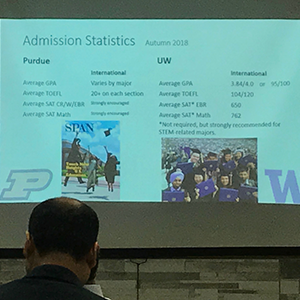 The visiting institutions were the University of Washington and Purdue University from the United States. Ms. Sabrina Moss, University of Washington and Quentin Law Phu, Purdue University represented their Campuses. Each representative briefed the parents and students about the University culture and the best courses offered at the campus. Some of the best courses offered are Pharmacy, Hospitality, Technology, Liberal Arts, Business & Management, Theatre, International Relations and Public Health & Care. This visit provided yet another prospect for the students to make career choices.